The US Department of Transport (DOT) estimates that nearly 10,000 people every year are killed by alcohol-related crashes. What if there was a way to save about 7,000 of those lives? According to the DOT this is possible and they are developing two types of alcohol sensors – one that is similar to a regular Breathalyzer sensor and will be positioned inconspicuously on the steering wheel, and the other will use infrared light to scan the skin and determine the driver’s blood alcohol concentration. Drunk driving is prevalent all across the world and many times people may not even realize how intoxicated they are – this new technology could solve the question people ask themselves “Am I okay to drive?” Since the legal limit for the blood alcohol concentration (BAC) is at or below 0.08, it will still be acceptable to have a few drinks with dinner and be able to drive home. If the BAC reaches above 0.08, the car will not start and the driver will need to find another way home. As with all new technologies, there are sure to be glitches. What if the driver is sober and is detected to be drunk? Even traditional breathalyzers have a tendency to make mistakes and not always be so accurate. Yet, Bud Zaouk, who is head of this in-car alcohol detection system project and director of transportation solutions at QinetiQ North America says that, “It doesn’t require contact, or even a deep breath, you just breath normally in it’s direction.” Along with it being extremely accurate and fast, this type of system only requires calibration once in it’s lifetime. As for the skin scanning system, there will be an infrared light that shines through the skin to measure the alcohol content found in the tiny blood vessels of a person’s finger or palm. 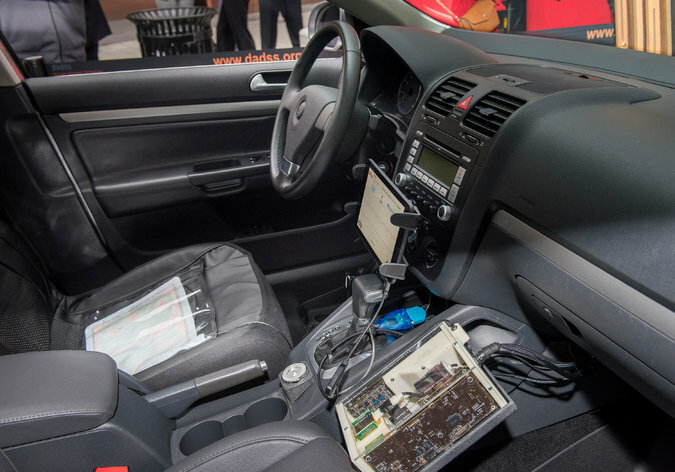 The idea is to make these sensors undetectable to the naked eye and therefore they can either be embedded into the steering wheel or on the stop-start ignition button – parts of the vehicle the driver will have to touch anyways in order to drive the car. The researchers behind these projects understand that some drunk drivers may try to cheat the system and use a passenger to unlock their car if they are intoxicated. To prevent that, they are also developing a “driver presence detector” which generates a signal while the person is pressing the button (or has his/her hand on the steering wheel) to make sure the person pressing the button is in fact, the driver and not someone else. It’s highly unlikely that this sort of technology will be something that is mandatory anytime soon, but having it be an option for purchase in your vehicle may still save many innocent lives. It could especially come in handy for teenagers and young adults, knowing that they don’t always make the best decisions when it comes to drinking and driving. Although most of us love all the latest gadgets, technology shouldn’t only be fun and games – which is why at Design Engine we love to see the advancement of technology making the world a better place for our generation and the generations to come. What do you think – can a car alcohol detector become something everyone will have in his/her car?